The Google Play Store, as we all know, is Google’s official app marketplace from where Android users and Google users can get the apps required for their smartphones. Some apps, which already come pre-installed in new handsets, do not need to be installed again but instead need to be updated. For all these actions the Google Play Store plays a crucial part in the functioning of a smartphone. Not only does the Google Play Store contain the updates for apps and new apps as well, but the Play Store itself also gets updated at regular intervals. There also might be that unfortunate incident where due to some technical glitch, the Google Play Store app on your phone may not work or is deleted. There is no reason to panic as in this article I will provide a step-by-step method so that you can get the Google Play Store downloaded again. From the left, swipe the menu to the right and then select Settings at the very end of the menu. Once you select the Settings, you will find the Google Play Store version that is currently on your phone at the very bottom of your screen. The latest version of the app at the time of writing this article is 6.8.24. As soon as you are sure about what version of the Google Play Store you have on your phone, search for the latest Google Play Store apk on your browser in the computer. Now download the latest version of the Google Play Store apk. A word of caution here. Since you cannot get the Google Play Store app from the Play Store itself, you have to be very careful about the site that you are downloading the apk from. Go for the big name sites which are authorities and are reliable. If you are going for sites that are not so popular, then you might be a victim of hacking and cyber crimes. It happens when hackers and malicious programmers put in some modifications in your Google Play Store apk. You unsuspectingly download and install the app, but it might contain some virus program that might steal all your personal data as well as bank account information. So be very aware. As soon as you find a site that you can trust, download the Play Store apk from it and keep it in an accessible place on your computer. You now have the Play Store apk on your computer. The steps that follow are all about your phone. Fire up your smartphone and move to the Settings menu. Then go onto Security and you will find an option called Unknown Sources. Enable the option. 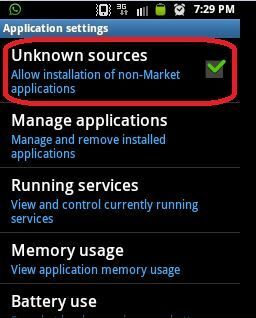 The Unknown Sources option allows you to install apps on your smartphone that comes from sources other than the Google Play Store. Google is, by default, suspecting of any other source for the download and installation of apps other than itself. Once you enable the option, you signal your smartphone that you trust the app developer. Otherwise, your smartphone will continuously provide you with warnings that the app is coming from an untrusted source. Most of the work is done now. The only thing that is left is actually installing the app on your smartphone. In order to do that connect your smartphone to your PC using a USB cable. Now transfer the apk file that you downloaded earlier to any folder on your smartphone. Find the app from the folder and then click on it to install it. As soon as you click on the file, you will get a prompt that will contain all the permissions required by the apk to get installed on your phone. Read through these permissions and keep clicking on Next until the Next changes to Install. Then, click on it. Your smartphone now has the Google Play Store installed on it. A word of caution again. After the whole process is completed, do not forget to turn off the Unknown Sources option which you enabled earlier during the process. It is because if you keep it enabled, then other apps might misuse it and cause some problems on your phone. It is, therefore, a critical step to remember. Follow the same process that you did earlier. Go to Settings, then Security and click on the Unknown Sources option. You will find that on clicking, the option is disabled. There is a recent update that Google has come up with for the Play Store. This update reiterates the fact that Google loves its users and therefore, cares for them in whatever way possible. We have all faced some tough times while updating apps, especially the ones which are very large. There have been lots of complaints regarding this app updating which makes users spend a huge amount of money every month just for app updation. It seems that Google has been listening to the feedback from its users and has, therefore, come up with a new algorithm that cuts down the size of app upgrades to 50% of what it was previously. Also, this time around while updating apps, users can see the actual app size that is to be downloaded instead of the full file size that the Play Store earlier used to display, thereby, confusing the users as to how much the download size would be. That my friends is the end of it. 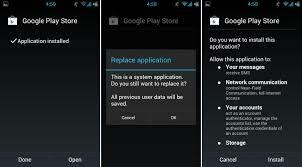 This is how you get the Google Play Store installed on your phone without any hassles. You can again enjoy the millions of apps from games to entertainment to movies from the Google Play Store.